Kontomo is a mobile app and web app service that bridges the gap between the Presenter, Artist, and Eventgoer. 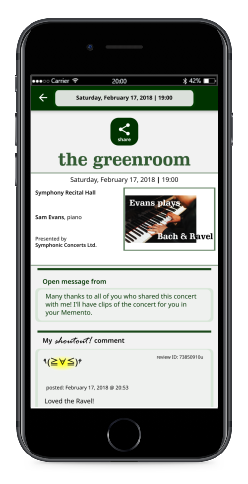 Kontomo is an interactive digital playbill tool that a presenter (i.e., the entity responsible for the artistic direction of the concert/event) distributes on-site to the eventgoer’s smartphone via a mobile app. Kontomo enables Eventgoers to interact anonymously without the need to create an account. And the Presenter and/or Artist(s) can follow-up on that feedback one-to-all or one-on-one! An easy-to-use playbill creation and deployment system. The ability to control the playbill during the concert/event. The ability to moderate the digital greenroom. Anonymous, with no account creation necessary. A private memento of the event, stored in the app. Kontomo is currently in active development and approaching initial release. 7 lucky Presenters and Artists who sign up will win a chance to use Kontomo free for one year!